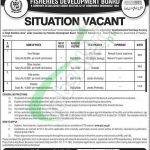 Get the career opportunity from Fisheries Development Board Jobs 2019 Application Form pts.org.pk. Applications are recently offered for all those applicants who are looking for the Federal Govt jobs so, Fisheries Development Board, which is working under the Ministry of National Food Security & Research is seeking to hire the energetic, educated, responsible and well-disciplined applicants are required for the following posts. Jobs in Fisheries Development Board to apply are (Farm Manager, Office Assistant, Field Workers, Chowkidar) are the posts for the project "Establishment of Trout Cage Farming in Gilgit Baltistan Area" which is waiting for the individuals to come and apply before due date. The appointment of these positions will be held on the contract basis which is further extendable. The qualification which is required for these posts is MSc/BSc/Graduation/Primary in the relevant discipline with 5 to 10 years experience in the relevant field. The applicants will be given attractive remuneration package with fringe benefits. Now, I will let you know about it's next heading of applying criteria below. FDB is the abbreviation used for Fisheries Development Board is working under the Ministry of National Food Security & Research, Govt of Pakistan which is held responsible to provide development the aquatic animals such as Fisheries sector and each year Govt is paying good attention towards this sector in order to better the growth of this sector. Being a Govt sector it offers Govt jobs of different levels. Address: PTS Head Office 3rd Floor Adeel Plaza Fazal-e-Haq Road Blue Area Islamabad.